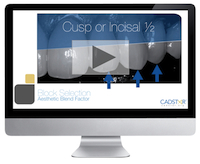 My block selection is primarily determined by desired brilliance for the incisal or cusp one-half of the restoration. This tutorial will review my primary strategy that guides my block color selection. View video in Chapter 5.